With Azurite, we have a stone that gives power to our voice and awakens our spirit and intuition to deeper things. It is a stone for communicators, but especially finds its power expressed when used by those who channel and communicate with spirits, and those with desire to articulate to their inner truth more clearly. In the depth and intensity of its brilliant, azure blue tone we find the reflection of our soul's desires, our mind's true power, and our heart's deepest yearning. Azurite is for the intensely psychic -- the ones who peer through the veil into mysteries unknown. It is a stone for the deep delvers of truth and spirit. It is the perfect complement for those who walk unabashedly into mystical realms, allow them to more easily tune into and communicate what lessons they garner from beyond. For the dreamers and visionaries whose souls travel onward to planes and worlds unseen, it is the perfect companion. But on a more pragmatic level, Azurite is for the studious intellectuals and seekers of knowledge. Whether cramming for that final exam, or writing complicated theorems on advanced subjects, Azurite provides a clear lens for the mind to analyze, and a deep reservoir for the storage of information. This powerful stone lends its energies to improving mental recall, clarity and function. From Cunningham's Encyclopedia of Crystal, Gem and Metal Magic by Scott Cunningham. Gaze deep and reflect on Azurite's brilliant blue hues the next time you are to sit down for a in-depth meditation. Azurite's power is receptive, empowering us from within, making it the perfect stone for those who are introspective, deep thinkers and psychics alike. Here are just some of the magical ways you can use the energies within Azurite to your benefit. Azurite is connected to the Third Eye Chakra, which is the chakra that empowers our intuition and imagination. Azurite can help with communication issues, as well as being understood, and understanding others more clearly as it is connected to the Throat Chakra. When it comes to the need for self-love, or a greater capacity at understanding and loving others, consider Azurite, as it is connected to the Heart Chakra. 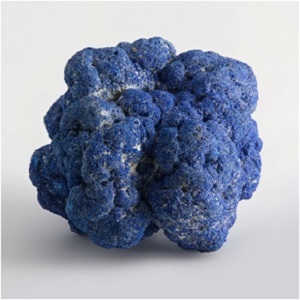 Use Azurite to stimulate the mind, awaken psychic powers and strengthen intuitive abilities. Keep Azurite nearby while meditating. It can help deepen the meditative experience and open you up to more spiritual insight and understanding. The healing power within Azurite is amplified when coupled with sound. 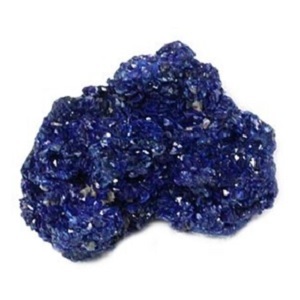 Meditative sounds such as Gregorian chants, choral music and drums will all have their calm and soothing power intensified while Azurite is nearby. For those who are keen to divinatory pursuits, such as Tarot readers and psychic mediums, keep Azurite close by. It can help open up the channels needed to access divinatory information, as well as make it easier to communicate the information you have gathered. Azurite is an excellent stone for the intellect and mental clarity, helping you keep focus and concentration. Carry it with you when preparing to take an exam for assistance with memory retention. Azurite can help lessen feelings of insecurity and self-doubt. It can help dispel fears and nervousness, especially when speaking and communicating with others. When dealing with situations in which you might feel less than empowered, such as when dealing with a bully or having people walk all over you, consider carrying Azurite. It can help you communicate what boundaries you need from others more effectively, and help you develop the voice you need to stand up for yourself. 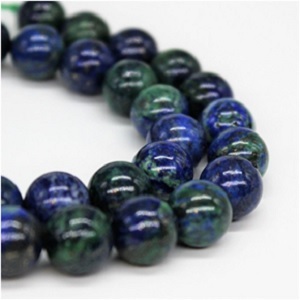 Use Azurite to uncover the root of your phobias. Its energy can help uncover what lies beneath our deepest fears and unmask them for what they truly are. Keep Azurite on a nightstand nearby or under the pillow before going to bed to inspire prophetic dreams. It can also encourage visions and spark new spiritual insights and ideas. Azurite can be of assistance when delving deep into the subconscious and trying to discern past lives. It helps the mind remove the trappings of ego and dispel the illusory world to see what's hidden and things beyond. A simple divination spell involving Azurite: In a darkened room, take two white candles and place an Azurite crystal between the two of them, then light the candles. Pick up the Azurite and hold it in your hand until it starts to feel warm. During this time, close your eyes and try to clear your mind of thought. Once you start to feel the stone's energy "touching" you, open your eyes and gaze upon the stone, and be ready to receive the answers you seek. Wherever you might find copper ore or Malachite, note that Azurite may be lurking nearby. Azurite is a form of copper ore, and shares very close similarities with Malachite stone, so much so that sometimes it will transform and become Malachite stone itself. (Another peculiar way Malachite is connected to the energy of transformation, but that's another article.) Here are so more interesting facts you may not have known about Azurite. Azurite is also known as Chessylite, named for the Chessy-Les-Mines near Lyon, France. Azurite is a soft stone, measuring 3.5 to 4 on the Mohs hardness scale. Although not the most useful pigment as it loses stability when exposed to air, Azurite has been commonly used as a pigment in antiquity. Mixing Azurite pigment with oil turns it green and mixing it with egg yolk turns it green gray. Azurite and Malachite are often found banded together, forming what is called Azure-malachite. There is a rare Azurite mixture called "Bluebird," which is a mixture of Azurite and Cuprite, a dark red stone. It is possible for Azurite to become Malachite. In some locations, Azurite will undergo a chemical change, losing some of a chemical known as hydroxyl and becoming Malachite. Some of the best quality and largest Azurite specimens come from Tsumeb, Nambia, although Azurite can be found in other places such as Morocco, France, Germany, Mexico and the United States. Azurite was originally named for the Persian word lazhward, which means blue. It shares this in common with Lapis Lazuli -- "lazuli" also coming from this root. Azurite is a form of copper ore and is commonly found in copper mines. What are the benefits of Azurite? Azurite is not only of benefit to psychics, mediums and mystics, but to those who are focused on their spiritual path and growing closer to their inner truth. Hold it in the palm of your hand when engaging in deep meditation and allow its energies to guide you to the root of your heart, soul and mind's truest will and desire. 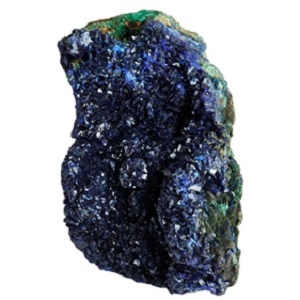 Azurite is connected to and equipped to heal the Throat Chakra, Heart Chakra and Third Eye Chakra. This means as it is connected to the Throat Chakra, it can heal this chakra which facilitates our ability to communicate and understand others. It's conection to the Heart Chakra makes it of benefit to those who seek better connection in their relationships and a higher sense of empathy. Azurite's link to the Third Eye Chakra helps us open up our intuitive pathways and psychic ability. Azurite Malachite, as the name suggests, is a combination of both Azurite and Malachite. The deep, brilliant blue of Azurite tends to wear during weathering, and the mineral will lose some of its hydroxyl. This causes Azurite to morph into Malachite over time. In the process, a beautiful, swirling mixture of Azurite and Malachite is formed. The best specimens of Azurite Malachite are often found in the United States, however, Azurite Malachite can be found in China and basically anywhere you might find copper ore.
What is the meaning of Azurite Malachite? Azurite has the ability to help us comb the depths of our soul and psyche, helping us to discover and articulate our inner truth and Malachite is the "stone of transformation." The two combined become wonderful and powerful agents for welcoming the change that might come into your life when you've engaged in some deep soul searching and are ready to live out your personal truth. Azurite is often found growing in conjunction not only with Malachite, but with a gem silica called Chrysocolla. With alluring shades of turquoise and cyan intermingling to give it is beautiful, enlivening hue, Chrysocolla brings a soft, gentle touch to the compelling blue of Azurite. Chrysocolla is not a mineral like Azurite, but a gem silica. However much like Azurite, it is soft and less than ideal for jewelry making unless combined with quartz. Azurite Chrysocolla can be found all over the world, from Mexico to Peru, the United States, Israel, Chile, and basically anywhere copper ore is found. What is the meaning of Azurite Chrysocolla? Azurite and Chrysocolla combined become the quintessential stone for communicators. Azurite's striking blue hue is a reminder of its ability to help us cut through the din and confusion that sometimes muffles our truest expression, while Chrysocolla is a gentle stone, helping us temper our voice and message with compassion, kindness and the air of peace. Azurite Chrysocolla reminds us that it is not only important to articulate yourself honestly and clearly, but to choose your words with wisdom and compassion. This is a great stone for those who need to have a difficult conversation with a loved one and have need to choose their words carefully to avoid causing further pain. What are Your Thoughts on Azurite Stone? What brings you to our article on Azurite today? Did you learn anything new? What do you plan to use Azurite for in the future? What other stones and you interested in learning about? We'd love to hear from you! Cunningham, S. (2011). Cunningham's encyclopedia of crystal, gem & metal magic. St. Paul, Minn.: Llewellyn Publications. En.wikipedia.org. (2018). Azurite. [online] Available at: https://en.wikipedia.org/wiki/Azurite [Accessed 21 May 2018]. Minerals.net. (2018). Azurite: The blue mineral azurite information and pictures. [online] Available at: http://www.minerals.net/mineral/azurite.aspx [Accessed 21 May 2018]. Mindat.org. (2018). Azurite: Azurite mineral information and data.. [online] Available at: https://www.mindat.org/min-447.html [Accessed 21 May 2018]. Energymuse.com. (2018). 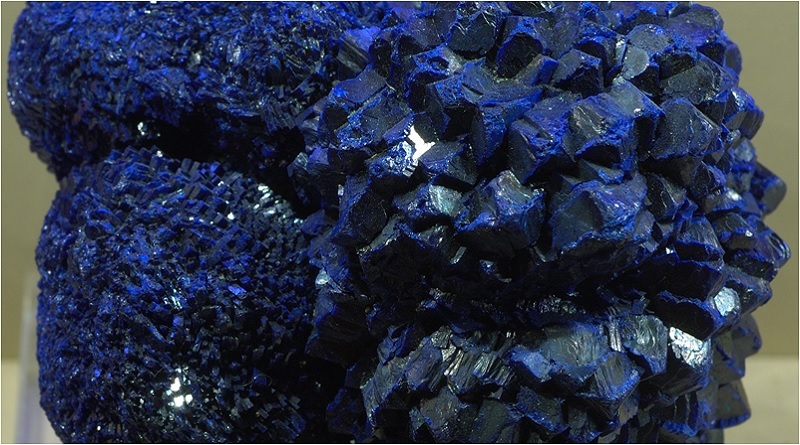 Azurite Meaning & Healing Properties | Energy Muse. [online] Available at: https://www.energymuse.com/azurite-meaning [Accessed 21 May 2018]. Crystalvaults.com. (2018). Azurite Meanings and Uses | Crystal Vaults. [online] Available at: https://www.crystalvaults.com/crystal-encyclopedia/azurite [Accessed 21 May 2018]. HealingCrystalsForYou.com. (2018). Azurite Stone Aids Third Eye Activation, Stimulates Psychic Gifts. [online] Available at: https://www.healing-crystals-for-you.com/azurite-stone.html [Accessed 21 May 2018]. Desertrosedirect.com. (2018). Azurite Malachite. [online] Available at: https://www.desertrosedirect.com/stone-database/azurite-malachite.html [Accessed 24 May 2018]. Crystalvaults.com. (2018). 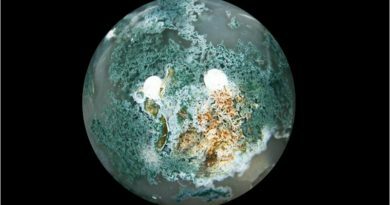 Chrysocolla Meanings and Uses | Crystal Vaults. [online] Available at: https://www.crystalvaults.com/crystal-encyclopedia/chrysocolla [Accessed 24 May 2018]. Healingcrystals.com. (2018). HealingCrystals.Com. [online] Available at: https://www.healingcrystals.com/Discover_more_about_Malachite__Azurite___Chrysocolla_Articles_1925.html [Accessed 24 May 2018]. Gem Select. (2018). Chrysocolla: Multicolor Chrysocolla Gemstone & Jewelry Information - GemSelect. [online] Gemselect.com. Available at: https://www.gemselect.com/gem-info/chrysocolla/chrysocolla-info.php [Accessed 24 May 2018]. Houston, D. (2018). Azurite Malachite: Meaning, Properties and Powers - The Complete Guide. [online] CrystalsandJewelry.com. Available at: https://meanings.crystalsandjewelry.com/azurite-malachite/ [Accessed 24 May 2018].